1. 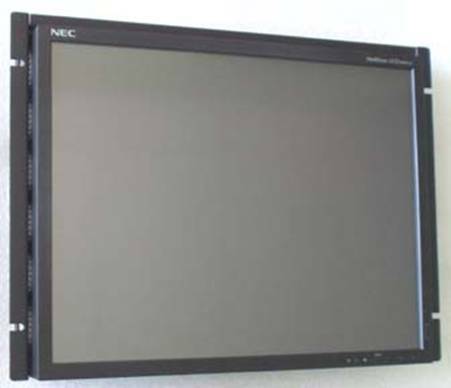 It is a good idea to power up and test the monitor before assembling it onto the rackmount kit, just in case if there is any problem with it (usually very rare). Otherwise, you may do all the work below and then have to un-do it. If the monitor is working fine, then proceed. 2. Lay the foam packing material that came in the box over a flat surface on a table or workbench. The lay the monitor facing down over the soft foam. 3. Push the release lever in the back to the left if looking from the front to remove the monitor from its stand. Note: Please store the stand in the box the monitor came in. In case of warranty service, you will need to re-assemble the stand back onto the monitor. 4. The Q-2020-RK comes with the upper horizontal bar attached. If any adjustment is needed, use a ¼” socket wrench to loosen the locknuts. 5. Mount the Q-2020-RK onto the monitor. 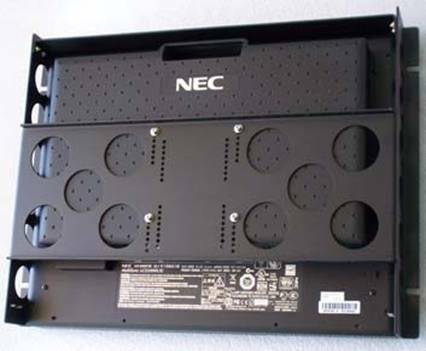 The metric screws that came with stand are usually too short for the rackmount bracket, so we supply you four 4 mm X 16 mm screws. Insert a No. 8 flat washer, a No. 8 spring lock washer, and a metric screw into each one of the four VESA mounting holes. Then tighten the metric screws. 6. Attach the VGA and power cables onto the monitor. Secure them onto the lower rackmount flange using the 5” tie wraps. Trim off the excess lengths of tie wraps with a wire cutter. 8. If you have any questions or comments, please call Harry Lee, 805-484-2454 or e-mail to hlee@flatmonitors.com.